Each chapter ends with a reading exercise. These exercises take the concepts from the chapter and place them in a real and more relevant context. Here, we will read some of Bhagavad Gita. But some of you might be wondering: what is the Bhagavad Gita, and why does this guide mention it so often? When it was first composed, the Bhagavad Gita (bhagavad-gītā, the "song of the blessed one") was different from almost every religious text before it. Set within one of the two Indian epic poems, it discussed philosophical and spiritual matters in the context of an extended narrative. The core of the text is a dialog between Krishna (kṛṣṇa) — variously considered to be a manifestation of some god, a manifestation of the supreme god, or the supreme god himself — and Arjuna (arjuna), his best and dearest friend. This conversation is overheard by Sanjaya (saṃjaya) and narrated by him to Dhritarashtra (dhṛtarāṣṭra); and this conversation is itself heard and discussed by two characters in the epic poem, and so on down to the person singing the poem and the listener himself. The setting of the Bhagavad Gita (or just "Gita" for short) is essentially this: for the sake of their honor and duty as warriors, Arjuna and his four brothers must fight their cousins, with whom they had a terrible dispute. Warriors and kings from all over the world joined the two sides to prepare for a tremendous war. Many of Arjuna's relatives and friends, for reasons that would take too long to explain, are bound to fight on the side of Arjuna's cousins. Then, when every attempt at resolving the conflict between the two groups has failed, they assemble on the field of Kurukshetra (kuru-kṣetra, "field of the Kurus"; "Kuru" is a family name referring to the ancestor of Arjuna and his cousins). This is where the Gita starts. The Gita is divided into eighteen chapters, and the first of these sets the stage for the rest. 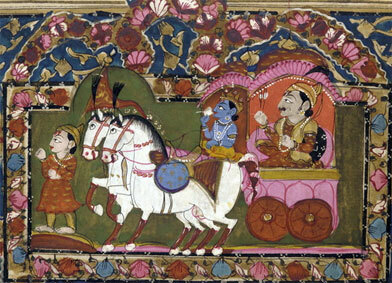 With Krishna as his charioteer, Arjuna goes to the center of the battlefield before the war begins. Seeing his relatives, friends, and teachers arrayed on both sides, he despairs at the thought that he will have to kill everyone he loves. Declaring to Krishna that he will not fight, he sits down on his chariot seat having cast aside bow and arrow, his mind overwhelmed with sorrow. The Bhagavad Gita is immensely popular around the world, and part of the reason for its appeal is its multivalence; that is, it is a flexible text with many interpretations. Over the years, dozens of different approaches to the text's message have appeared. But although its main meaning is ultimately elusive, its grammar is simple and straightforward. For that reason, this guide will feature many excerpts from the Bhagavad Gita. This short introduction will do well for now. Still, we should remember that great religious figures have written commentaries on the Gita for at least a thousand years. The Gita is still an important text. Here, we will read the first 30 verses of the Bhagavad Gita to practice our pronunciation. Sanskrit from the Bhagavad Gita is easy to read and pronounce, and it has a nice mix of heavy and light syllables. The recording that we'll use is in the so-called "northern" style, which is more melodic and has slightly looser pronunciation. Despite this, the chanter here does a fairly good job. The chanter usually pronounces the visarga as an echo of the vowel in front of it. Notice where he does not. The chanter usually pronounces the vowel i as a short version of ī. Notice where he does not. The chanter usually pronounces a consonant with an extra vowel sound if it appears at the end of a line. The chanter sometimes pronounces o as aḥ. The reason for this will be explained later in the guide. Click to load lesson audio. The "stick" character (।) is used to separate the text into verses and lines. The apostrophe (') can be ignored for now.